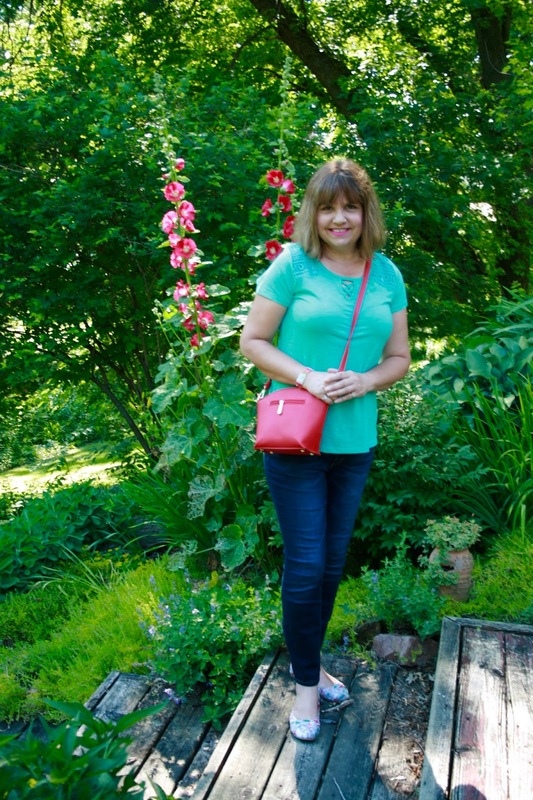 Back in April I did a "How To Wear A T-Shirt And Jeans" Fashion Post and to my surprise, it ended up being one of my most popular fashion posts of the year. Proof that you don't need a lot of expensive clothes to be a style blogger. Most women looking at style blogs are looking for ideas on how to look good every day with simple clothes like T-Shirts and Jeans. Well our weather in Wisconsin still hasn't warmed up much so I could pull out my shorts or short skirts, so this was an outfit I wore on a recent shopping trip. The T-Shirt is new this season. I bought it from Shopko. I never buy clothes at Shopko (If you don't have this store in your area, it's similar to a Walmart) but I had $10.00 in Shopko cash that could only be used on apparel. The top was on sale for $10.99 so I got it for .99 cents! Can't be that price! If your interested in it, it's still available, and it's cheaper at $9.09! The T-Shirt is very unique because first of all, it's a very pretty color, but it also has a lot of interesting detail. The shoulders and back have a crochet panel and the neckline has a criss cross notch neck. 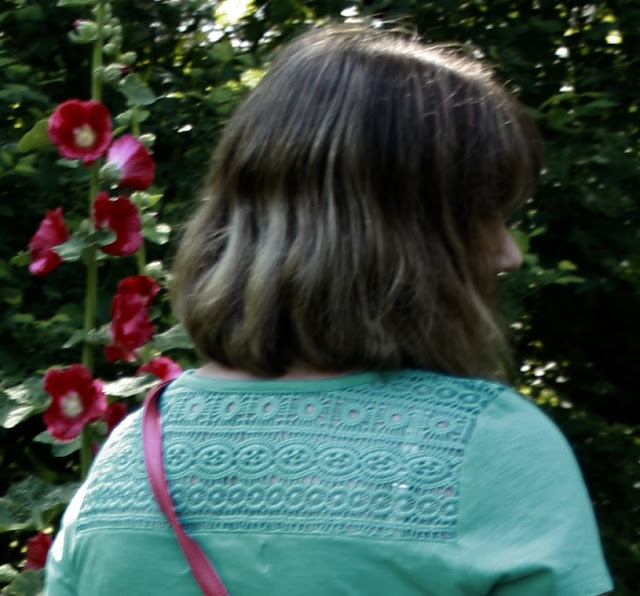 To keep "T-Shirt and Jeans" outfits from being too boring, look for T-Shirts that have pretty colors or interesting details like this one! As always, accessories and shoes are extremely important in creating a successful T-Shirt and Jeans outfit. I chose a bright red bag and a multi-colored beaded bracelet to wear with my T-Shirt. Since I had a lot of solid color in my outfit, I went with some pattern in my shoes. I picked these soft floral flats (old) to wear for a long day of shopping. The teal and red color in the shoes coordinated well with the T-Shirt and bag. My jeans are also new this season. They are from Liz Claiborne, sold at JCP. What a great steal! This top does have so many interesting details. I really like the crochet lace back panel. I couldn't agree with you more about choosing accessories with a punch to go with your basics. Very cute! Thanks Jennie! I love a good bargain, especially on a fabulous tee like this! 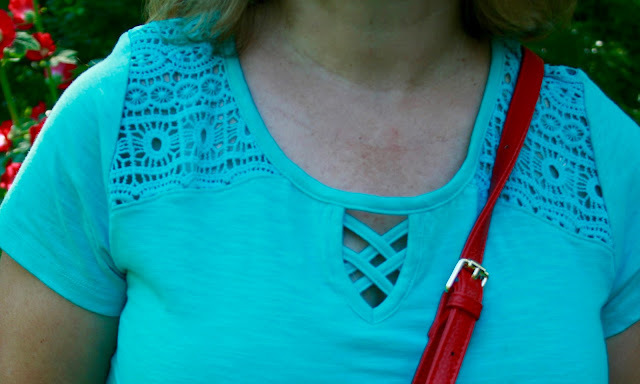 Great details in this t-shirt and love the color! Especially love those shoes! Thanks Elli! These shoes are old, I don't wear them enough. I feel I have to be wearing a solid colors elsewhere on my body and also have a coordinating color that's in the shoe to wear them...thus the reason they don't get worn much. I'm not a big fan of print mixing. I love the details on this shirt, Amy!! I couldn't see it in the Instagram post as much!! Thanks Jodie! I probably should have done a close-up layout picture on Instagram. Bargain! 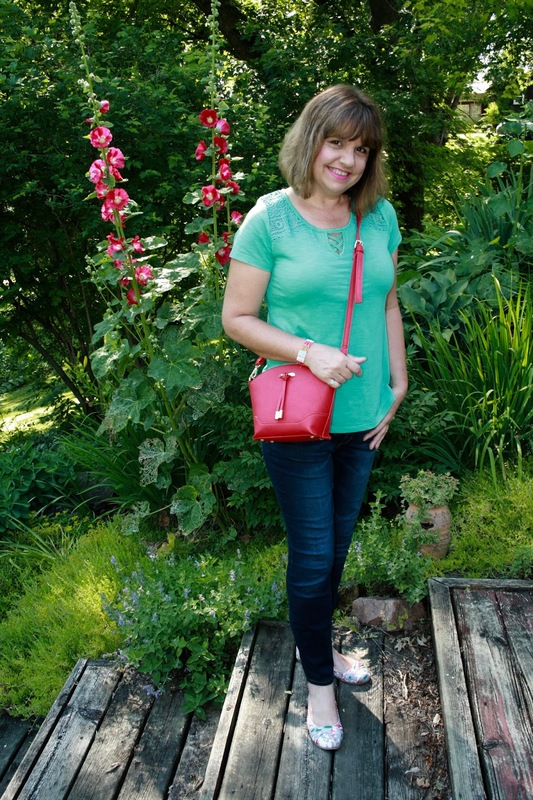 For me, blogs really are about the day to day outfits and t shirt and jeans with a twist are a staple for us all. And I love how you've brought your colours together in those sweet shoes. Thanks! Yes, I totally agree. I prefer seeing day-to-day outfits rather than dressy ones on blogs. Thanks so much! 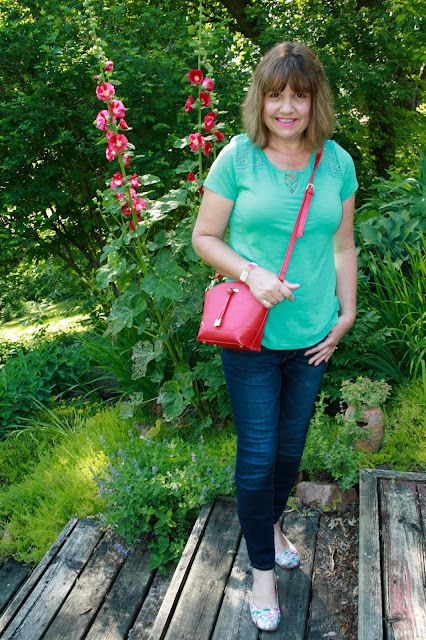 I had to make an ordinary T-Shirt and Jeans Outfit interesting and color was one way to do it! Thanks for linking up to Top of the World Style. This look is so cute. 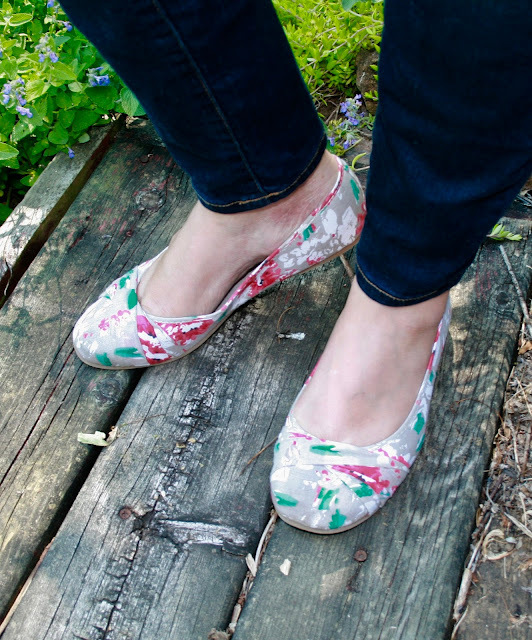 Your flats are such a great find and the icing on the cake in this look! Well done! Thanks Nicole! I think I need to wear these flats more often based on the response I got for them!